Ask yourself: What am I doing that isn’t helpful in creating a positive workplace? This could include both actions (complaining about a co-worker to another colleague) and attitudes (harboring anger and grudges for past offenses). Consider your response carefully. See if any of the attributes below might apply to you. Don’t beat yourself up if you have done any of these things (they are a common response to stress), but do recognize they may be a sign that you need to take some time to recharge and re-evaluate the image you would like to project about yourself. Actively demonstrating positive communication is the third simple step we each can take. Sometimes, this can be as simple as saying, “Wasn’t the sunset beautiful last night?” Or, “I’m sure thankful for air conditioning.” Positive comments tend to dampen and “throw water” on a smoldering, negative environment. A second way to be positive is to share your appreciation for your teammates and the work they do. A simple “thanks” can be meaningful, especially if it’s specific. Something like, “Jen, thanks for getting your paperwork to me on time. That will help me get the information together for the manager’s meeting without having to rush at the last minute.” This can be an effective way to “soften up” those colleagues who seem fairly hardened and angry—though, it may take some time. All of these results contribute to higher costs for organizations. Research has shown that companies with high levels of staff who feel appreciated are 18% more productive and 22% more profitable than companies with staff who report low levels of feeling appreciated. In fact, finding and training new employees is one of the most expensive non-productive costs to businesses. Employees have different languages of appreciation (and unique actions within each language.) Believe it or not, not everyone likes verbal praise. Some people don’t trust words while others believe “actions speak louder than words.” For some, time together is the most important message you can send. 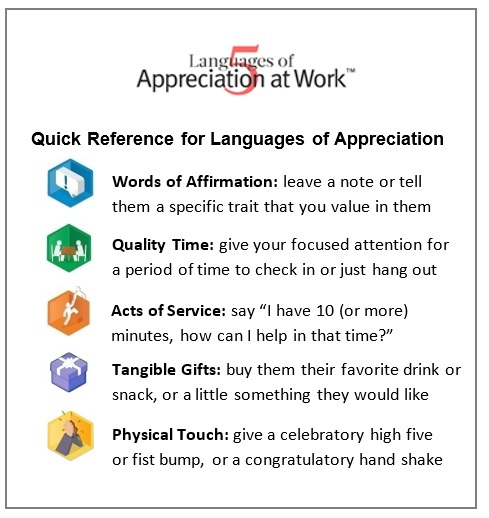 We have identified 5 Languages of Appreciation in the Workplace (see the chart below). It can be difficult to determine which of the five languages of appreciation an employee prefers. As a result, we created an online instrument that identifies team members’ primary and secondary languages of appreciation, and allows them to specify the unique actions important to them. When an employee’s preferred language of appreciation and specific action that is meaningful to them are used, we can “hit the target” and help them feel genuinely appreciated. Staff morale can be improved by helping team members feel truly valued. The key is to communicate authentic appreciation in the ways that are meaningful to each team member. Over time, as leaders and colleagues learn to effectively communicate appreciation to each another, people begin to value others and feel valued for the contributions they make, which in turn increases their motivation and morale.